Orthopedics is a great application area for 3D printing as a manufacturing process as it generally requires small numbers of bespoke parts – designed specifically for the recipient in order to give them exactly the support they need. But why is polypropylene such a great material for these parts? On paper, its fairly easy to see why – PP is very durable, has a certain amount of ‘give’ to it (meaning it flexes slightly rather than cracking under load), it’s non-toxic, moisture and chemical resistant making it easy-to-clean and ideal for skin-contact applications. 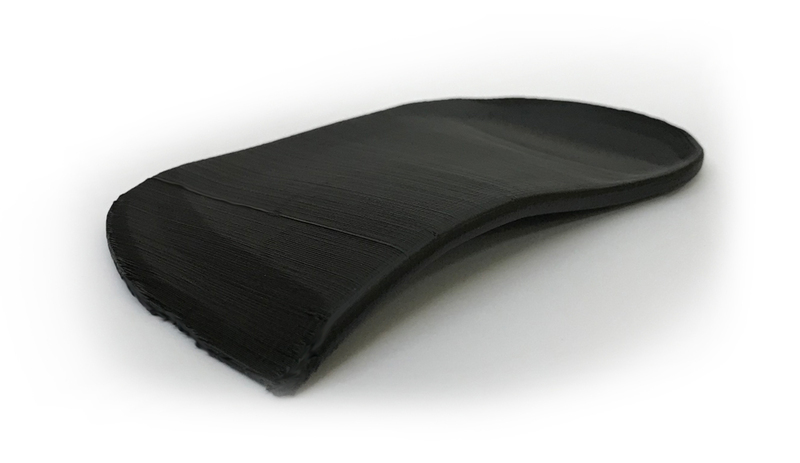 To give you a practical example, a supporting foot-bed printed with our F43 Tough material provides excellent support for the base of the foot, whilst also flexing where its needed to flex – around the ball of the foot when it’s being walked on – without the foot-bed cracking or failing in any way. So much so that a foot bed flexed for 50,000 cycles was indistinguishable from one fresh off the printer. OK, so why has it taken so long for the orthopedics industry to turn on to the idea of 3D printing with PP? Put simply, Polypropylene is relatively new to the 3D printing world and has a reputation for being difficult to work with, with poor warp control. The latter part of that can certainly be true – it took us several years of working with polyolefins (the polymer family to which PP belongs) to be able to modify the properties of PP to allow it to print well whist retaining the physical properties PP is popular for. Our approach is unique in that we use no fillers to achieve this – meaning resistance to stress and impact is particularly high. It’s certainly the case that care needs to be taken when setting up the printer to work with our materials. With the correct set up it’s possible to print great, warp-free, structural and functional parts. In the case of orthopedics, these parts can dramatically improve people’s lives – something we’re proud to be playing a part in. The good news for our customers is that we use all the feedback from the work that’s taking place to further improve our customer support and advice (a lot of which is right here on our website – http://www.forefrontfilament.co.uk/using-our-filaments) – we aim to help you to get the best from these amazing materials.